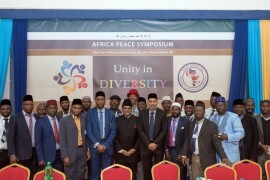 Over the years, the Pan-African Ahmadiyya Muslim Association (PAAMA) UK has hosted an annual Post Jalsa Salana UK Reception in honour of Jalsa Salana delegates from Africa, and other senior members of the Jama’at. This year’s customary event was held on Sunday, August 30th at Fazl Mosque, London. The programme, which was chaired by Amir UK, Rafiq Ahmad Hayat Sahib, commenced with Tilawat by Hafiz Abdullah Sadiq and English Translation by Jalaludeen Latif. In his welcome address, the President of PAAMA-UK, Tommy Kallon Sahib highlighted the event as an auspicious occasion that enables the delegates from African countries to share updates on the progress of Jamaats in their respective countries. In addition to The Abdul Wahab Adam Merit Award launched last year, this year’s event also heralded another merit award which recognises the efforts of missionaries of non-African origin whose services and devotion have enhanced the cause of Islam Ahmadiyyat in Africa. 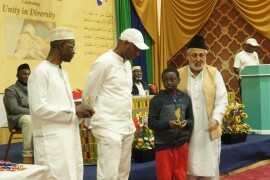 With the guidance of His Holiness, Hadhrat Khalifatul Masih V (aba), the award was named The Abdur Raheem Nayyar Award, in honour of the late missionary’s pioneering services in more than one African country. This was followed by brief updates by various Umara on the progress of Jama’ats in their respective countries of designation. The Umara echoed that the continuous progress of and triumph over oppositions faced by their respective Jama’ats in the past years is highly attributable to the blessings of Allah and the Divine guidance of His Holiness, Hadhrat Khalifatul Masih (aba). The first session concluded with closing remarks by the Amir UK, Rafiq Ahmad Hayat Sahib. The second session of the event commenced after Zuhr and Asr prayers, upon which the attendees were graced with the presence of Huzur Aqdas (aba), who presented awards to the distinguished honourees for their outstanding services to the cause of Ahmaddiyyat in Africa. Before presenting the main awards to the under-listed recipients, a special award was presented in absentia to Maulana Mir Waseemur Rashid Sahib currently serving in Sierra Leone for his remarkable achievement in winning the MTA International Tilawat Competition 2015. • Maulana Mubarak Nazir Sahib, Missionary In-charge Canada for services rendered over 23 year in Sierra Leone as a missionary teacher between 1968 and 1985. • Maulana Mahmood Nasir Sadiq Sahib for rendered over 18 years in Burkina Faso, Ivory Coast and Mali including 9 year as Amir Burkina Faso and 4 years to date as Amir Mali. • Maulana Saeed-ur-Rahman Sahib for services rendered over 27 years in Sierra Leone, Ivory Coast, Nigeria and The Gambia including 11 years to date as Amir Sierra Leone. • Maulana Chaudhry Tahir Mahmood Sahib for services rendered over 23 years in Ghana, Uganda, Zambia and Tanzania including 8 years to date as Amir Tanzania. • Maulana Abdul Khalique Nayyar Sahib for services rendered over 24 years in Nigeria, Cameroon, Equatorial Guinea and Chad Republic. 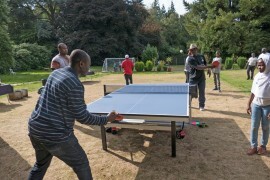 He is currently serving as Missionary In-charge Nigeria. Huzur then led in silence prayers before lunch was served.